Be the first to share your favorite memory, photo or story of Margaret "Sue". This memorial page is dedicated for family, friends and future generations to celebrate the life of their loved one. Our beloved Mother left this life in the hands of the Lord on Friday, February 8, 2019. She was in her home surrounded by family when she lost her battle with ovarian cancer. 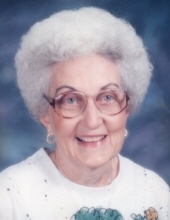 She was the youngest child of early Coleman County pioneers, Hugh and Maggie Wheat, being born on the farm 18 miles southeast of Coleman on October 6, 1926. She graduated from Mozelle High School and Tarleton State University. Then, one day in a drug store in Coleman, she met the love of her life, a Texas A&M student from Coleman by the name of Johnny Richardson. They were married on November 25, 1948. Upon Johnny’s graduation from A&M, they moved 14 times in 15 years with the oil business. Soon after moving to San Angelo, they moved to A&M Ave., where she resided for 54 years until her passing. When Johnny died in 1978, she got a social security number and went to work as an aide for SAISD at Reagan Elementary until retiring in 1998. Then in retirement she did what she always had, kept an impeccable home because she was always a bundle of energy. She is survived by her children Susan Denise Zentner, husband Jim of Rockwall, TX, Johnny Dean Richardson, wife Maginer of Lake Ivie, TX, Michael Gene Richardson, wife Connie of San Angelo, TX, and Joy Diane Shelton, husband Curtis of San Angelo, TX; grandchildren Andy Richardson, wife Cori of Lemon Grove, CA, Chris Zentner, wife Dinorah of Mansfield, TX, Matthew Zentner, husband Rene of Tenn., Lance Richardson of Ogallala, NE, Blake Shelton and Slade Shelton of San Angelo, TX; Great-grandchildren Greg Richardson, Abby Richardson, Anthony Jimenez, Michael Jimenez, Nathaniel Zentner, Thomas Zentner, and Jon Zentner. A Visitation will be held Wednesday, Feb. 13th at Harper Funeral Home from 6:00-8:00PM. The Funeral Service is 11:00AM, Thursday, Feb. 14th at Harper Funeral Home with burial to follow at Lawnhaven Memorial Gardens. A special thanks to her caregiver, Rita Garza and her nurse, Sarai Cox with Kindred Hospice. Also, a huge thanks to Lance Richardson for all that he has done for his Granny. Donations may be made to Meals for the Elderly since she loved to feed everyone. Mother we love you and will miss you dearly, God Bless. "Email Address" would like to share the life celebration of Margaret "Sue" Wheat Richardson. Click on the "link" to go to share a favorite memory or leave a condolence message for the family.